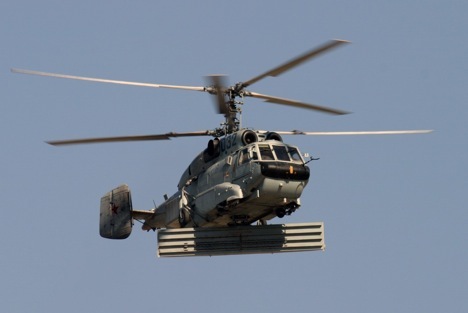 The Indian Navy has an urgent requirement for Ka-28 anti-submarine warfare and Ka-31 radar picket helicopters. Russia is ready to supply more helicopters for the Indian Navy, if it receives a request from the Indian side, the head of the biggest helicopter building company, Russian Helicopters, said on Tuesday. “As for the Vikramaditya aircraft carrier, this will undoubtedly be a decision by the Indian side. The holding company (Russian Helicopters) will be ready to continue its program of deliveries to India under a contract with Rosoboronexport,” Alexander Mikheyev said. India has a fleet of Kamov Ka-28 anti-submarine warfare (ASW) helicopters and Ka-31 radar picket helicopters, but many of the former are in need of an upgrade according to sources. “Correspondingly, if the Indian side will opt for these helicopters in the future, we are ready to meet this request,” Mikheyev added. The INS Vikramaditya carries 6 Ka-28s and Ka-31s. When the aircraft carrier was handed over to the Indian Navy in November 2013, Russian Deputy Prime Minister Dmitry Rogozin suggested that the two countries consider the possibility of setting up a joint venture to assemble Kamov helicopters in India. “We have a serious proposal for India which refers not only to purchases of Russian helicopters. Russia as India’s strategic partner proposes setting up a joint venture, including on India’s territory,” Rogozin said in November. India at the moment has an urgent requirement for Ka-28s for its frigates, as many of the older helicopters are not believed to be in working condition. A deal is, however, not imminent. Defence procurements by India have more or less come to a standstill as the country’s general elections are in their last phase, with the results due on Friday, May 16. A decision on purchases of helicopters is only likely to be made in June after a new government is sworn in and functional, sources told RIR. There are also concerns about theKa-28 and Ka-31 helicopters in India since they are powered by Ukrainian engines, according to the sources.